Upper Galilee head argues that Lebanese terrorists are busy with in-fighting and have no interest in new campaign. Roughly a dozen rockets were fired from Lebanon into Israel during Operation Protective Edge, and residents of the north have reported signs of terror tunnels being dug into Israel from the country - but according to the head of the Upper Galilee, there's nothing to worry about. Upper Galilee Regional Council head Giora Zaltz told Arutz Sheva that in contrast to the worrying reports, "the opposite is true, we have a very nice period now of calm and quiet in the Galilee and the Golan, and all the scenarios they are talking about are scenarios they have been talking about for four years now." One such "scenario" that Zaltz was asked by concerned residents about recently was raised in an odd security briefing last Sunday. In it, a senior IDF Northern Command officer caused concern by saying Hezbollah could possibly capture Israeli territory for several hours before being pushed back by the IDF, in a war that could take four months to win. That appraisal is made the more troubling by a New York Times interview this week that revealed Hezbollah is benefiting from indirect military aid from the US. Zaltz commented "something is always liable to happen in the state of Israel, and certainly in border communities, but there's nothing new in that." The Upper Galilee leader referenced the threat of Hezbollah leader Hassan Nasrallah, saying "in appraisals of the situation it is being stated explicitly that the other side is busy with fighting among themselves, the Syrian army is also fighting terror organizations in Lebanon; they are busy with (events) inside, and there is no reason or interest for anyone on the sides to start a conflict." "Hezbollah doesn't need a tunnel"
Despite the reports of terror tunnels from Lebanon, Zaltz invited Israelis to visit the north without fear, saying "as of today all of the investigations that have been conducted - and many have been conducted - have not found even a single tunnel." "I'll tell you what's more, here you don't need a tunnel to cross the border. Twenty-two communities are already on the confrontation line adjacent to the border, so that if someone wanted to do something they wouldn't need a tunnel," said Zaltz, in a statement unlikely to reassure many. "But as I said no one has the will to start a new campaign today, certainly not on the other side; all of the commentary is irresponsible," concluded Zaltz. 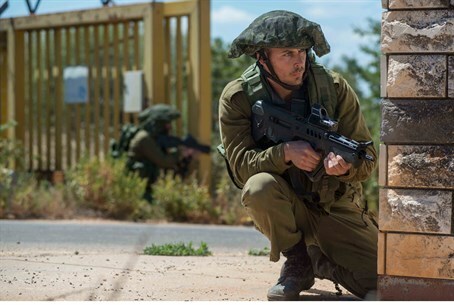 The talk of tunnels comes after IDF sources earlier in the month revealed to Arutz Sheva that the army is in fact concerned about the tunnel threat, and is quietly investigating the possibility of Hezbollah terror tunnels. Many residents of the north have reported hearing the sounds of digging and hammers from underneath their homes, coupled with evidence of active cement mixers and construction trucks carting out earth on the Lebanese side under the cover of greenhouse structures. Concerns were also raised by geologist and Col. (res.) Yossi Langotsky, who last month told Arutz Sheva that he had tried to warn the security establishment about the tunnel threat from Gaza for nine years, but that his warnings fell on deaf ears. Langotsky indicated that a similar threat exists on the Lebanese border, pointing to Hezbollah ties with North Korea which has advanced tunnel digging technology.